Otto Spaargaren passed away at Bennekom on March 13th 2015 at the age of 71. Everybody will remember Otto as the winner of the third IUSS Guy Smith Award with which the IUSS community recognized him for his major contributions to international soil classification and correlation with special reference to the World Reference Base for Soil Resources (WRB). Otto started his professional career as Educational Officer at the International Soil Museum (now ISRIC – World Soil Information), Wageningen from where he undertook numerous soils projects all over the world: soil survey for rice production in the Niger Delta in Nigeria; soil survey for the Mahaweli Development Project in Eastern Sri Lanka; feasibility for irrigation in Western Nepal. Otto also spent numerous years overseas in various projects such as the Soil Survey of Zambia and Coordinating the African Acid Soils Network of the International Board for Soil Research and Management (IBSRAM). Otto spearheaded under FAO the first classification system for top soils in the world and was involved in the work on Land Quality Indicators (LQI) under the authority from the World Bank. From 2006 to 2010 he was the Chair of the IUSS Working Group WRB and from its foundation till 2006 he served as Vice-Chair and Secretary of the Working Group. Otto was a soil classifier in heart and soul. His contribution to international soil classification may be defined as designing and checking its architecture (and controlling its rules). The other dimension in Otto’s approach was harmony both within one system and among systems. In Otto’s world of soil classification, WRB has its unique place which he iconized as “umbrella between equally worthy national soil classification systems”. With his concern to come to harmonization with Soil Taxonomy, Otto made numerous moves with the definitions of the diagnostics in WRB, so as to bring WRB and Soil Taxonomy closer to each other. Otto’s enthusiasm for soilscapes has inspired many young soil scientists. He really was a master in animating the discussions in the profile pits and then bringing the floating ideas towards a consensus by projecting them on his vast field experience. 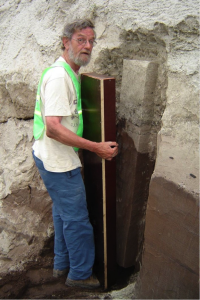 Not only that, during numerous field excursions in the margin of international soil congresses, Otto would sneak out to collect numerous soil monoliths which are now on display in the soil museum at ISRIC and at the places of origin. In the quietness of the magnificently refurbished International Soil Museum at ISRIC, Wageningen, The Netherlands, Otto Spaargaren will always remain present through the numerous soil monoliths which will continue inspiring people from around the world in eternity.